Yesterday I took what is politely called a "mental health day." I stayed home from work. I did not edit any of the four large projects I have on the burner. I did not do chores. What did I do? I watched Supernatural. Specifically episodes from Season 8. Yes, I know I'm very behind. So why did I spend a whole day wasting time? 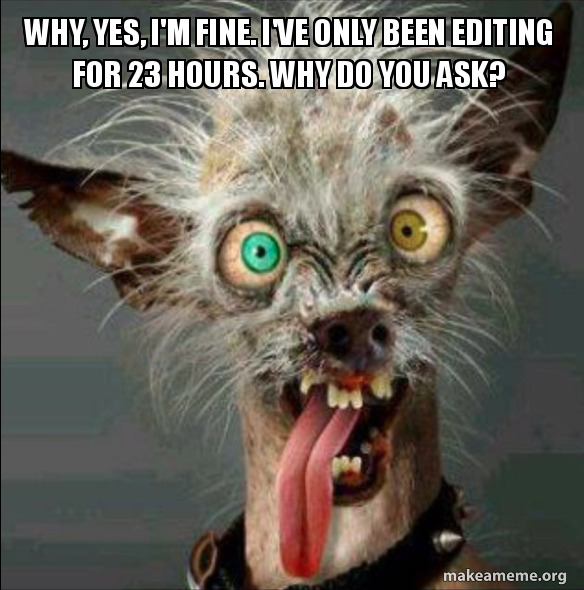 Because for the past three weeks, I have been rising at 5 AM every single week day and at 7 AM on weekends to ensure I can do my freelance editing, which has been ramping up lately. My day job has also become more trying because I have been voluntold to take on light project management duties, a job that requires meetings... so many meetings. In addition, there is keeping the house in order, the yard in order, spending time with the husband, spending time with the dog, and sometimes, time permitting, socializing with one of my four friends. Oh yeah... and I'm trying to finish my second novel. Folks, I am SO CLOSE. I literally have two scenes to write. Two scenes. The wrap-up and the epilogue. I should be done with this by now. But life, as it so often does, keeps getting in my way. And it has been taking its toll. I often listen to motivational YouTube videos while I work, videos featuring soaring music and quotes from movies and speeches that prompt you to rise up, overcome, and harness your power to "get it done." But there comes a point where you need to just put it aside and let yourself rest. You can't create if your mind is cluttered with your own life. So for everyone out there who is trying to write a book, and you get depressed every time you think about it because you're not making the progress you wanted, I am here to give you permission for a day off. Stay home from work. Don't answer your phone. Watch your nerdy TV of choice. Even one day of absolute nothingness is incredibly healing. As far as Fissure is concerned, I don't have a date for you. But I want to have the writing done by the end of July and then have my editor look at the last portion. What I can tell you is I will not let it out the gate until it's done. That is my promise to you.